When you decide to introduce bird feeders into your garden, make a commitment to the care of your feathered friends. Birds come to rely on a food source, especially in the winter, so make sure to keep your feeders well-stocked and clean throughout all the seasons. The best reason to serve up a delightful bird feast in your garden is to encourage them to stop for a visit and, if you're lucky, choose to nest in your yard. By having a large population of birds, you help to rid your garden naturally of unwanted pests and promote a healthy, well-balanced ecosystem. Birds also bring pleasure, a chance to enjoy watching and learning the different species, and the additional symphony of song in the evening and morning. Who doesn't enjoy a little friendly tune while digging in the dirt? Birds are also particularly beneficial to lawns. If you have a large carpet of green, then you know the struggles necessary to keep it healthy and maintained. Birds can help you with this quest by feasting on all your grass's enemies. Even if you live in a mostly urban environment, bird feeders play a crucial role in your yard, no matter how small. As more metropolitan areas spread into natural landscapes, the birds' natural food sources disappear. Therefore, your garden becomes a critical food supply for our fine feathered friends. There are two main categories of bird feeders, natural bird feeding through plants and supplemental feeding. Even placing something as simple as a piece of wood that you routinely turn over will help the birds catch leaf-chomping insects, slugs, and snails. Also, if you can tolerate them, dead trees are a great natural food source for many types of birds. Platform Feeders - A feeder with a flat surface on top, it functions nicely for all types of birds. Some include a roof, known as Fly-Through Feeders. These are perfect for attracting chickadees, nuthatches, and finches, which are all natural predators of common garden pests such as loopers and cabbage worms. Tube Feeders - Very common with active bird watchers, these are long tubes that hold the seed and have many small perches, allowing a flock to eat all at one time. As the perches are usually quite small, these are best for smaller bird types and are frequently used for attracting finches. Hopper Feeders - These restrict the birds from overeating by storing the food in a hopper. The seed lasts longer, and some of these feeders can even be "squirrel proof", although the accuracy of that claim will depend on the intelligence of your garden squirrels. 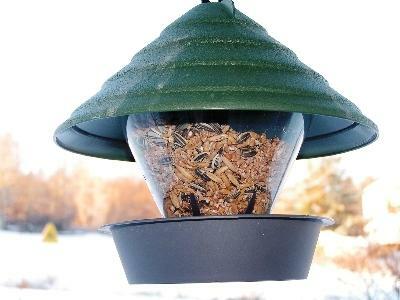 Specialty Feeders - With the popularity of bird watching and feeding over the past decade, the market for bird feeders has exploded. 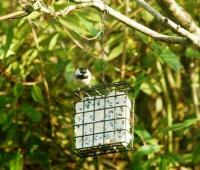 You can easily find a variety of specialty types including Wire Mesh Feeders, Thistle Socks, Suet Feeders, Woodpecker Feeders, Bubble Feeders, Window Feeders, and many more. Whichever type of feeder you chose, make sure it has a roof to keep the toxic mold from developing and that it is not constructed from plywood as chickadees will eat the glue. Also, clean your feeders often to prevent diseases and deter rats. For a quick easy craft, you can make your own winter bird feeder with a pinecone, birdseed, and peanut butter. Simply spread the peanut butter over the entire pinecone surface, roll it in the seed, and hang it outside for the birds to enjoy. This craft is fun to do with children, and the feeders make great gifts! Different kinds of birdseed will attract different varieties of birds. Check with your local Audubon Society or Bird Shop for their recommendations for your specific area. After selecting your bird feeder, placement is of utmost importance. The more feeders you place in your yard, the more birds will visit -- but you will also have more maintenance. You will need to discover your own perfect balance. In addition to the number of bird feeders, consider the location. The feeder should be easy to get to, as it will need to be cleaned and refilled often. It is also nice to have the feeder in a site that is good for comfortable bird viewing. Finally, look under the feeder as it will be a prime spot for bird messes to accumulate. Placement is also important to the birds. If a feeder is not attracting any birds, it is in the wrong location. You want bird feeders to be protected from winds and other harsh weather conditions. They should be close to shrubs for the bird's sense of comfort, but not too close for the bird's safety. To protect from cats and other predators, a feeder should be at least three feet away from any large vegetation. Offering a variety of bird feeder types and locations will ensure you have a nice selection of birds in your garden.